With the wedding on the near horizon or perhaps already out of the way, real life is setting in and the consolidation of two lives is about to begin. 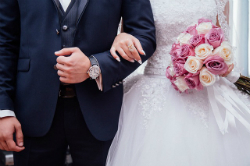 Marriage affects your finances in many ways, including your ability to build wealth, plan for retirement, plan your estate, and capitalize on tax and insurance-related benefits. Now is a good time for you and your spouse to discus your finances. Sharing financial responsibilities can be a bit tricky, especially if one of you is a spender and the other is a saver. Hopefully you have spoken with your spouse about your current financial picture or how your combined financial life will work. It may be important to sit down with your financial planner to begin working on your future goals and the financial plans needed to help you pursue those goals. If you simply want to share your money, you and your spouse should determine your net worth. In addition to income, make sure to list other investments like mutual funds and other investments, checking and savings accounts, money market or CD's, employer benefits such as 401(k)s, life insurance, real estate holdings and any other assets. Just as important you need to consider monthly expenses. In addition to housing, food, and other predictable expenses, don't forget to include disability and health insurance premiums, taxes, credit card debt coming into the family, and school and auto loans to name a few opportunities. When you have identified all your income and expenses for your life together, it is time to build your budget. Budgeting can be tough, but you want to avoid going into your marriage heavily in debt. Sit down together and consider how much you can spend – not how much you want to spend - and stay on track with your financial goals. Think about where the money will come from and how it can best be used for both of you. It is never too early to develop a disciplined budget habit. To begin with, look for ways to cut cost starting with the wedding. Devise a plan and use a checklist to aid in the planning and budgeting for the big event. Be sure to include estimated costs and stick to the plan. Schedule a honeymoon that fits your budget too. Create a monthly budget that helps you meet your financial goals. Make sure to set aside money for entertainment as well as emergency expenses. A good rule of thumb is to save from three to six months in expenses, including rent/mortgage, utilities, loan payments and any other outgo that must be met. When you settle in, determine how cash flow in and out of the family will be handled. Many couples set up joint bank and brokerage accounts while others choose to keep their incomes separate and divide the bills. There are many other alternatives to checking and savings accounts. The key is to ensure you are meeting your commitments and building wealth. Although it doesn't sound too romantic, marriage means paperwork. For example, if you are the wife and take your husband's name, you will need to change your name on your driver's license, credit cards, Social Security card and even your passport. Another area to consider a name change is any legal documents such as your will. Supporting documentation such as a birth certificate and/or a marriage certificate may be needed. Also, remember to update any employer retirement plans and/or financial investment accounts. Some, but not all, pensions provide benefits to widows or widowers following a pensioner's death. When participating in an employer-sponsored retirement plan, married workers are required to name their spouse as beneficiary unless the spouse waives their right in writing. In addition, it would be important to update beneficiary information on any other legal documents that provide for distribution of your assets after death such as bank accounts, real estate, business contracts, IRA's and annuities. If you die or became so disabled to where you could not earn a living, what would your family do to meet the monthly mortgage and car payments as well as pay the utilities, taxes, and other bills? While there may be some actions that could be taken to convert assets to income producing investments, the results probably would not replace your income. Life insurance is one of the most effective tools for replacing lost income as it can deliver a designated amount of money to your spouse (if listed as beneficiary). Disability income insurance is another way to protect your income should you become disabled. There is no better time than now for you and your new spouse to begin building wealth for your future. Having well-thought out goals and a solid plan to address those goals is key as you begin your lives together. There are many strategies for accumulating money for a house, college savings, retirement or other goals. Working with your financial planner is a great way to help you identify those goals, and seek to build your wealth and protect what you have built when necessary. Because of the possibility of human or mechanical error by DST Systems, Inc. or its sources, neither DST or its sources guarantees the accuracy, adequacy, completeness or availability of any information and is not responsible for any errors of omissions or for the results obtained from the use of such information. In no event shall DST Systems, Inc be liable for any indirect, special or consequential damages in connection with subscriber's or other use of the content.